Each of these has it’s own advantages and disadvantages. I’ve explained the differences between these types of telescopes below. If there are any terms you are unfamiliar with, please refer to my glossary for an explanation. A refracting telescope is the simplest type of telescope and probably the most recognizable. It’s design is so simple, that it is essentially a tube with a lens at each end. 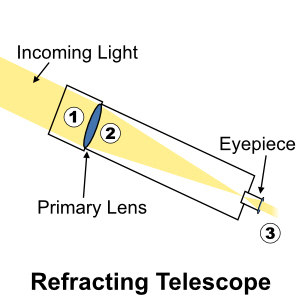 How refracting telescopes work, is actually very simple. Light enters through a main objective lens at one end (1). The lens refracts, or bends, the light to a point of focus (2). This is then magnified to form an image by the eyepiece at the other end (3). Because of their simple design, they are generally easy to use and more reliable as their optics are permanently fixed and aligned. They can be heavy, especially larger aperture telescopes, because of their need for large lenses. They can also have a longer body which may impact on transportation and storage. They may also be more expensive, as large high quality lenses are more costly to produce. Cheaper lenses are more susceptible to aberrations. A reflecting telescope is similar to a refracting telescope, but just a little bit more complex. It is called a reflecting telescope because it uses mirrors to reflect the light internally. 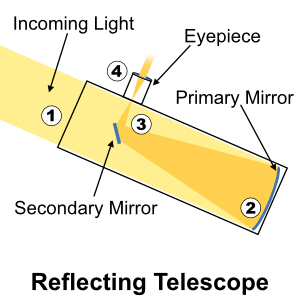 As previously mentioned, the way a reflecting telescope works, is similar to reflectors. Light enters at one end (1) and is then reflected by a concave shaped primary mirror at the other end (2) towards a smaller mirror known as the secondary mirror. This mirror reflects (3) the light into the eyepiece, which is usually mounted on the side of the telescope (4). Fairly compact and portable which is great for transportation and storage. Generally more affordable. Mirrors can produce less optical aberrations. Mirrors need regular re-alignment as they can easily slip out of alignment due to knocks and bumps or temperature changes. They can be susceptible to spherical aberrations. 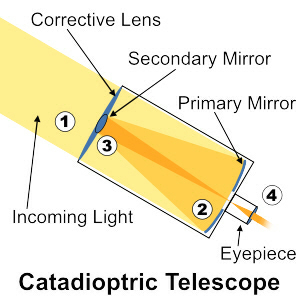 The Catadioptric could be considered a hybrid refracting/reflecting telescope, in that it uses both mirrors and lenses to form the image. How a catadioptric telescope works is rather quite interesting. Light enters at one end through a correcting lens, which helps reduce aberrations (1). It is then reflected by the primary mirror (2) at the other end back towards the secondary mirror mounted in the center of the corrective lens. Here it is reflected (3) back towards a hole in the primary mirror and into the eyepiece (4). When focusing, it is the primary mirror that is moved, not the eyepiece. Most catadioptrics are extremely compact and portable. The optics provide the advantages of both lenses and mirrors, so they make a great all purpose telescope. They may suffer a slight loss of light because of the positioning of the secondary mirror. Also catadioptrics may suffer from image shift, or a jump in focus, due to the primary mirror being moved when focusing. If you are ready to begin star gazing, Amazon has a wide range of telescopes to suit all skill levels and budgets. You will find a selection of those currently available, listed below. This entry was posted on December 14, 2011, 11:55 am and is filed under Information. You can follow any responses to this entry through RSS 2.0. Both comments and pings are currently closed.